Photo: Alice Clements/UNICEF. Where to begin? NAIROBI, 16 March 2015 (IRIN) - The scale of Vanuatu’s cyclone disaster is matched only by the complexity of the required humanitarian response, according to both the government and aid workers arriving on the battered Pacific islands. 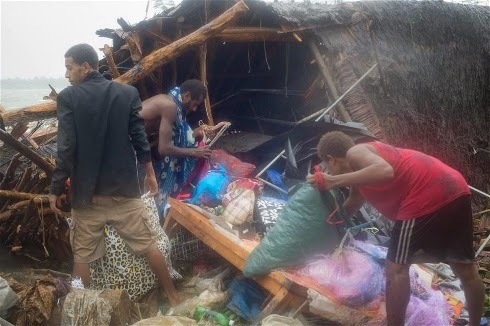 Vanuatu President Baldwin Lonsdale was reported by the BBC as saying the 13 March storm had "wiped out" all recent development and the country would have to rebuild "everything". Half the population - 132,000 people - are estimated to have been affected by cyclone Pam, including 60,000 children, according to UNICEF. Initial assessments indicate 90 percent of houses have been damaged in the capital, Port Vila, with destruction on the southern island of Tanna “significantly worse”, Care Australia reported. More than 3,300 people are sheltering in 37 evacuation centres on the islands of Torba and Penama, and the main island of Efate. But the National Disaster Management Office will need help if people remain displaced for a prolonged period. The humanitarian response “is almost going to be like applying a medical triage, to work out which is the most urgent”, said Clements. Aerial assessments have been carried out so far by military aircraft from Australia, New Zealand and France, with more flights scheduled for Tuesday. Commercial flights have resumed to Port Vila despite damage to the airport. “There is need for logistics experts and light reconnaissance planes/helicopters, pilots, and fuel to deliver supplies and conduct assessments. There is also a need for sea shipping to transport food, water and rebuilding materials,” the UN’s Office for the Coordination of Humanitarian Affairs (OCHA) reported. The main hospital in Port Vila is badly damaged, patients have been transferred to a newer part of the building, “but there is an urgent need for medical supplies” and “the morgue is unserviceable”. Twenty-four people are confirmed dead so far, but the toll is expected to rise as assessment teams reach the more remote islands. Providing clean water for survivors is a priority. There is a risk of waterborne diseases, especially dangerous for pregnant mothers and young children, and food is also likely to be a problem in the coming days with fruit trees uprooted, root crops inundated, and animal pens destroyed by the 270 km/h winds and flooding. “Eighty percent of Vanuatu’s population engage in subsistence agriculture as a primary economic activity. It is anticipated that emergency food relief could be needed for up to a month, plus longer term recovery support,” OCHA noted. Vanuatu has “3,000 years of experience dealing with an incredible mind-boggling range of disasters, from earthquakes to volcanos. People have great coping mechanisms, but this was a category 5 storm," Clements said.